You are currently browsing the Meranda Writes weblog archives for January, 2008. The Monte Carlo Casino on the Las Vegas strip is on fire. 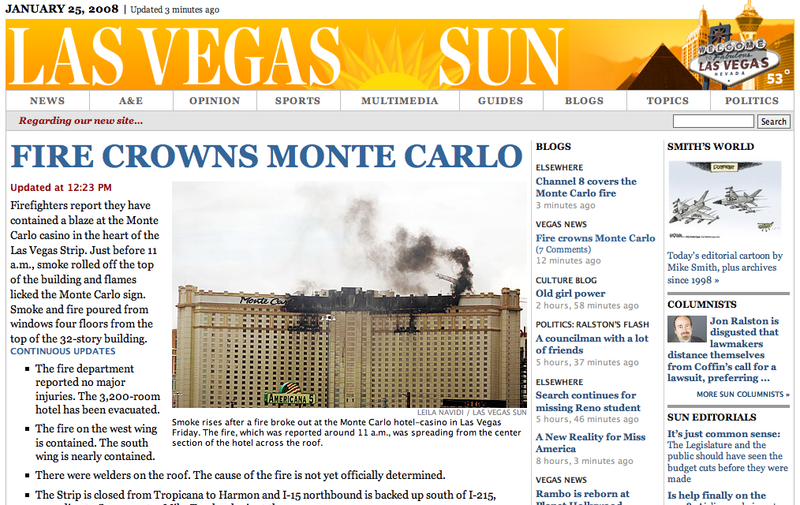 For that news, the Las Vegas Sun has got you covered. I learned, instead, via Twitter. It was also the way I heard about the recent market turmoil and the death of Heath Ledger. I know I’ve been writing a lot about Twitter of late. But that’s because it’s become increasingly part of my daily routine. Where once Facebook was a dominant force for keeping in touch and updated, these days I find myself updating and reading Twitter instead. (To be fair, my Twitter status is fed to Facebook.) And I find it far more useful and helpful for me. 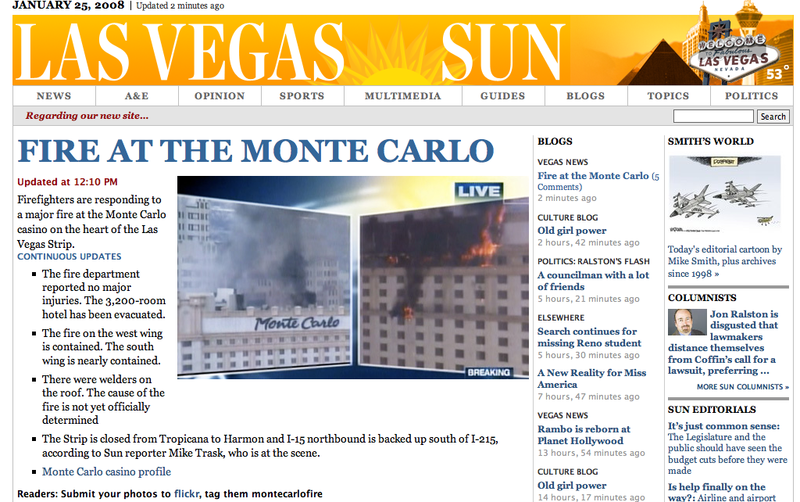 On a related side note, I love the Las Vegas Sun’s approach to the story. They’re updating the blog with new info. But I like the approach on the front of the site. It’s bullet by bullet what you want to know. No B.S. no he said, she said. Just what is going on, what has already happened, who is affected, and where to get more information. Nice and concise. I just saw a tweet from a follower on Twitter worth sharing with you. Note, this guy is a member of my community. I do not know him, but he randomly found my twitter a week ago and started following me so I started following him to see if there’s anything interesting. One day, I happened into a coffee shop while reporting a story and ran into a person I’d never met but who I knew from Twitter. In fact, I just watched another local person micro-blog a focus group that I helped set up for my paper. I didn’t know he was part of the group until I saw the first post and put 2+2 together. I’m not surprised by that, and wish the summary I get would be so concise. My question to you: Who at your organization is watching the tweets of your citizens? Who are your citizens following? I think I may seek out a few more locals to follow because it’s definitely interesting. Did anyone else catch that Twitter went mainstream today? Kind of. Though I’m still defending myself from the Twitter jabs my peers pour on — even the most tech-savvy of them doesn’t “get it” — The New York Times, thankfully, does. The NYTs’ fourth most e-mailed technology story of the moment is this gem, Campaign Reporting in Under 140 Taps. 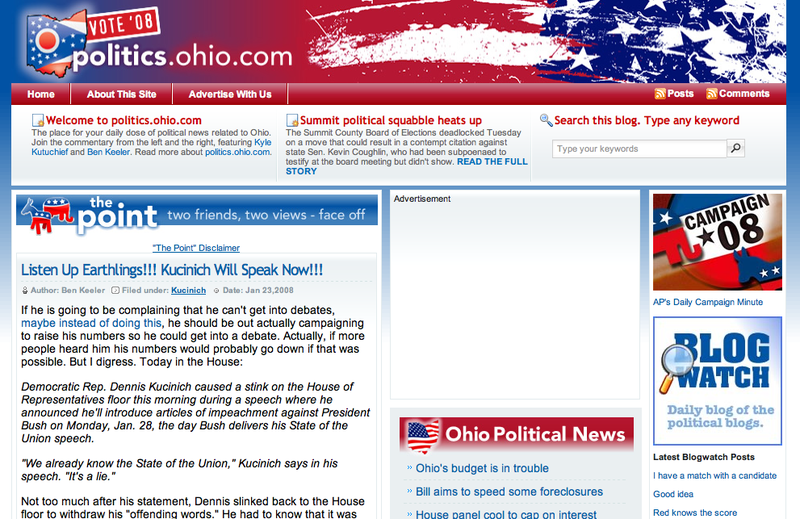 It’s a look at several political reporters micro-blogging the presidential campaigns through Twitter and the like. Nothing particularly enlightening, though a few comic anecdotes. As Mr. Knox makes clear, news has always come in different sizes. Despite the new gadgetry, these journalists are actually rediscovering telegraphese — the clipped (ideally witty) style that flourished because of word limits imposed by an earlier technology, the telegraph. Today, it is the limits imposed by text-messaging. To Josh Tyrangiel, the managing editor of Time.com, “the business thinking is the same as almost all of my business thinking: Why not?” The more exposure to Time.com’s material, the better, and no one can afford to be choosy about the setting. So Ms. Cox also has a Flickr feed for her photographs from the campaign trail that Mr. Tyrangiel is happy to promote. Ultimately, he said, it is a hopeless fight. Why it matters though is, and I have no idea where this ran in print or if it did, this will get Twitter before a mass audience of people who may not even be as tech-savvy as my peers who tell me “Twitter just sounds like a dirty word” or joke when I ask if they read an interesting story about whether I saw it on Twitter. I just laugh. Roll my eyes. Give them a plea to try it out. And then succumb to the inevitable “Dear blogger” jokes that aren’t far behind it. But they mean well, and one day they’ll get it, too. I’m not giving up on trying to win them over just yet. BTW: You can follow me on Twitter here. My updates are protected, but I’ll add you. (Since it’s mostly personal observations, I want to know who’s reading.) They’re also fed to my Facebook status, where you can also add me by searching my name.